25 cm 192 p. : col. ill.
Paul Hollywood is Britain's favourite master baker. His new book is all about bread - how to make it and how to use it. But while it's all very well making a lovely loaf of bread, can you guarantee that it won't be wasted? You know those times when you have a lovely crusty loaf, fresh from the oven, and you have a horrible feeling that after the initial excitement is over, half of it's going to get pushed aside and not eaten...? Well, maybe it's time to bring bread back into mealtimes for real. Not only are Paul's recipes delicious but they are also foolproof, with comprehensive step-by-step photographs. Try your hand at a basic white bloomer, which can become a savoury picnic loaf; stilton and bacon rolls, which are excellent served with celery soup; fluffy crumpets, which become the base for eggs Benedict; flatbreads, which are a natural pairing with chickpea masala; ciabatta, which the Italians have traditionally used as a base for tomatoey panzanella; pizza bases, which can become home-made fig, Parma ham and Gorgonzola pizzas; or white chocolate and raspberry bread, which makes for the best summer pudding you've ever tasted. 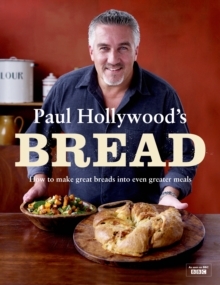 Tying in with the BBC2 television series, Paul Hollywood's Bread is all that you could want from a book and more.